George Grenville (1712-1770) was a Whig politician, a member of the British parliament and prime minister of Britain between April 1763 and July 1765. 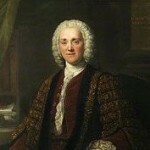 Born into a wealthy and powerful family, Grenville was educated at Eton and Oxford, graduating with a law degree in 1735. Six years later he was elected to parliament for the seat of Buckingham, a ‘rotten borough’ with just 13 voters. During the 1750s Grenville became a friend and ally of Lord Bute, tutor of the young Prince of Wales (the future George III). He held some minor offices during this period, such as treasurer to the navy. His reputation was enhanced by Britain’s victory in the Seven Years’ War and George III’s elevation to the throne. Grenville’s contribution to the American Revolution begins with his service in the dual roles of Prime Minister and Chancellor of the Exchequer (April 1763 to July 1765). Confronted with a large war debt and fearing a French war of retaliation in North America – or, at the very least, Native American uprisings incited by the French – Grenville looked for ways to make the Americans responsible for the cost of their own defence. He became one of the main supporters of the Stamp Act, probably the most inflammatory of all British policies in America. Grenville’s Stamp Act was passed in March 1765 but was never effectively implemented, due to protest and noncompliance in America. Grenville lost the confidence of George III, who forced his resignation in July 1765. History remembers Grenville as considered a skilled and knowledgeable legislator but a poor statesman who misread the Anglo-American situation.